No we aren't having a baby brother but a a delighful young man I know has a new baby brother. I made his christening gown featured here six years ago. It is shown here in my very first post. 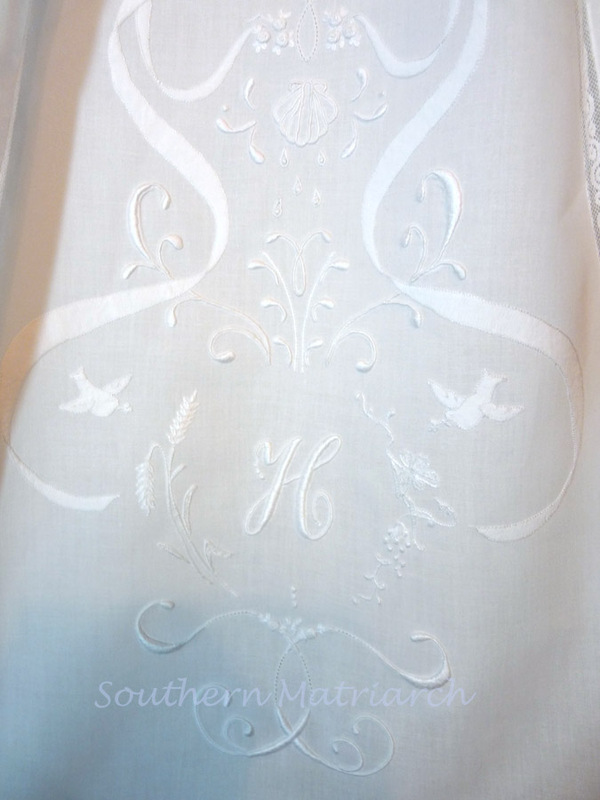 Baby brother was born in June and it is time for him to be baptized so..
the gown has been washed and ironed to be made ready for this weekend. I am sure it will be a joyous occasion. I have worked on many gowns, but I have to admit that it is one of my favorites. Something I am very proud of. It is a combination of patterns and designs that mommy chose. 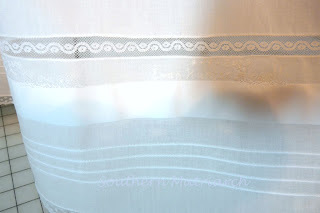 The base pattern is from Australian Smocking and Embroidery. It is "Eternal Love" from Issue #42. I love this gown. I smocked only the two side sections, not the entire width across the skirt. It has lace and tucks on the bodice as well as the hem of the skirt. The neck binding and piping are both a satin fabric for just a touch of shine. The center panel is a compilation of several designs. 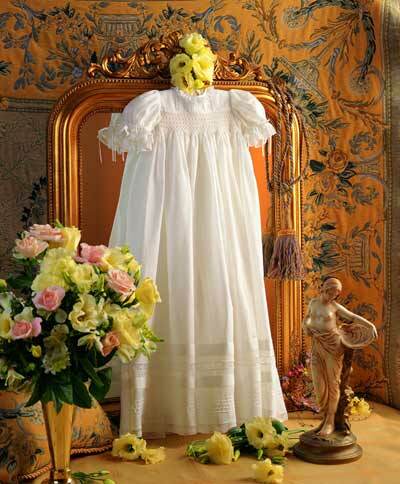 The shadow work ribbon and many of the curly q's are based on the christening gown featured in Wendy Schoen's Creating Heirlooms for Baby. I simplified the ribbon and bows since this gown was originally made with a boy in mind. The other embroidery I gathered from antique designs, the internet and clip art. There is high relief satin stitch, applique cord and surface embroidery featured on the front panel. I personally like to include references to the sacraments in the embroidery. The shell and water is for Baptism, the doves for Confirmation and the wheat and grapes for Eucharist. And then a Christian cross. In MY opinion, a christening gown is a pretty androgenous garment. 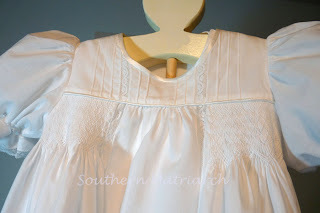 A baby boy is just as angelic in a christening gown as a baby girl. My son wore a gown and was never accused of being a sissy. And I hear the first wearer of this gown gave the little neighbor girl a bloody nose today much to his mother's dismay. I have been widely quoted as saying to the young men who dated my older daughters, "If your son can't wear a christening gown, you need a new girl!" Thank goodness both of my son in laws knew I was serious. Hopefully any future in laws will also believe me. I also embroidered baby brother's name on the gown. This is not the best picture and I blurred the kid's last name. I embroider the name on the gown as opposed to the slip because often over time the slip can become separated from the gown and that history is lost. I replaced the ribbons in the sleeves. I had used a poly satin ribbon the first time. The ribbons just did not look as nice as I would like so I replaced them with silk satin ribbons. They hang much nicer. 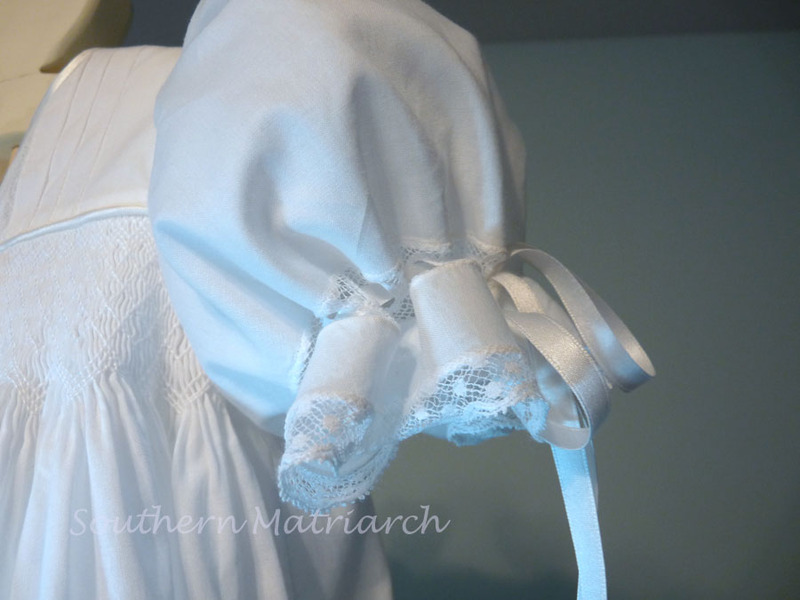 After a good soak in Biz to rewhiten the gown, it was starched, ironed and delivered today to the baby's mother. Now back to our baby's gown. Don't forget there is only a few more days to leave a comment on the Sew Beautiful Blog tour post here to enter the giveaway. This is absolutely beautiful. I especially love white on white shadow work and the combination of several types of embroidery. This is definitely a treasured heirloom. Embroidering the name on the gown is a great idea. The slip could get lost. All of your creations are lovely, but this one especially so. I am thrilled it will be worn by another little one! 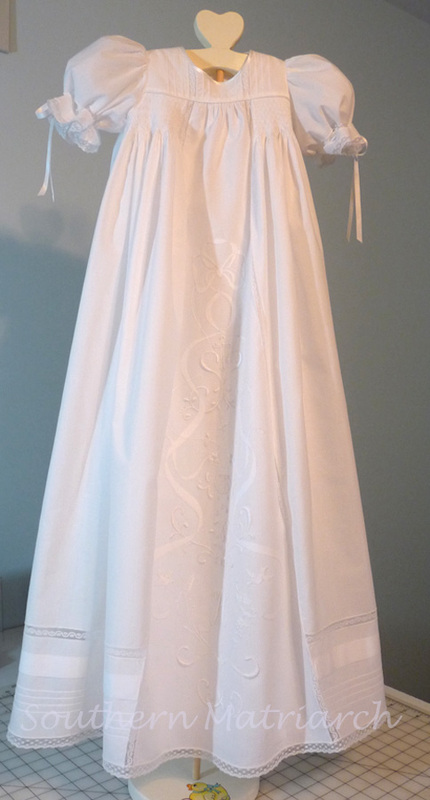 I am so glad you were able to get the droll of this gown... :) Your pictures really do not do it justice. 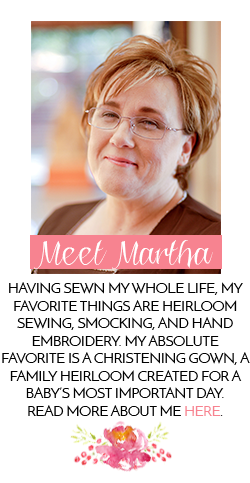 Martha, this is so lovely and I can clearly see the sentiments you stitched it with. A breathtaking heirloom!